We have selection of Nissan, Toyota, Suzuki and Jeeps. We have automatics and standards some with AC some without, double cabin trucks along with 2 and 4 door Suzukis and Jeep Wranglers. 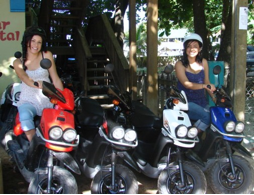 Our Scooters are Yamaha 100cc two stroke, automatics. 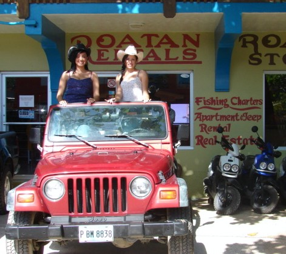 We are located in the center of West End, Roatan. 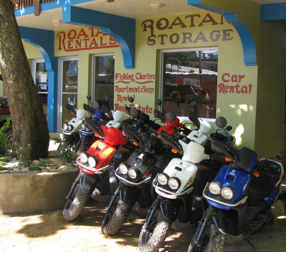 With extended rental we offer pickup and drop off in the West End/West Bay/Sandy Bay areas if needed. We will pickup and drop off at the airport with rentals of a week or more. Car and truck rates run from $50,to $75 per 24 hour day plus tax. Scooters are $35 per 24 hour day plus tax. Items needed at time of rental: Valid: Credit Card, Drivers License and Passport. Reservation accepted with one day’s rental NON-REFUNDABLE deposit. 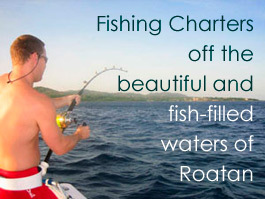 We accept Visa Master Card and American Express.